Soooo, I’ve now hosted brunch for mine and Barclay’s parents all together at my place twice. And I have royally messed up the meal…twice. The first was that lovely time when the quiche refused to set up and the crispy potatoes were anything but crispy. And the second — a few weeks ago — was that lovely time when I made a version of this soup in the slow cooker that was a little too slow and never quite got cooked. Apparently I went to church and accidentally set the crock pot on “low” instead of “high”, and after dishing up everyone’s bowls, realized that everyone was crunching down on half-cooked lentils and veggies. Shining moments, indeed, for this food blogging hostess. Really, this soup began as one of those clean-out-the-pantry-and-dump-everything-in-the-crock-pot kind of meals for me. And since this boyfriend of mine is vegetarian, I decided to nix adding the Italian sausage (although I’d totally recommend it for you meat-eaters in this recipe). The one ingredient that I did run over to the market to purchase was a big batch of collard greens. Ever since I had Kathryne’s lentil soup while we were living in Austin, I’ve been obsessed with adding collards to my soups. They taste great, they hold their texture amazingly, and they also add a nice bright green “pop” to any soup. I’m now a total fan! The second time around, I also experimented with making this recipe on the stovetop as well as the slow cooker. And I’m happy to say that either will work! If you do the slow cooker version, just keep in mind that lentils take awhile to cook. So bargain for a little extra time than most slow cooker recipes usually require. Once it’s done, you’re welcome to serve the soup “as is”, which also happens to be vegan. Or you’re welcome to load it up with Parmesan cheese and extra fresh parsley or basil, which would make this vegetarian. However you make the soup, I feel like your batch is going to turn out great. ;) Enjoy! 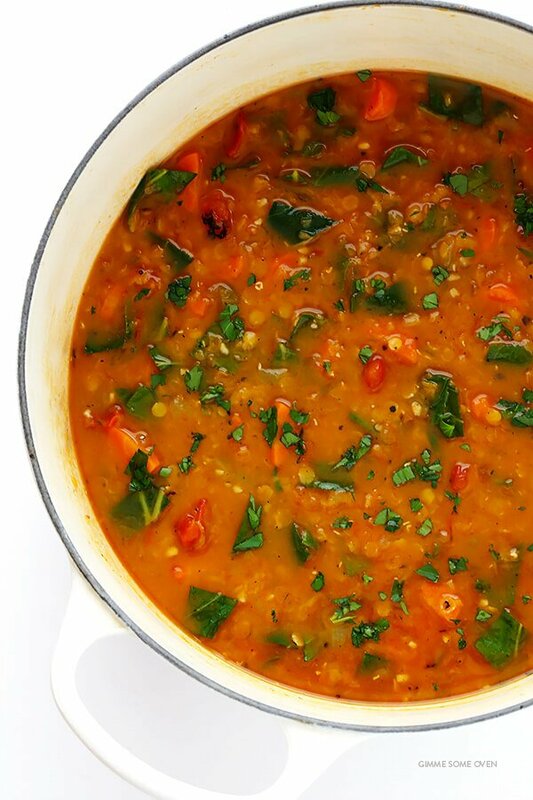 This hearty Italian Lentil Soup recipe is easy to make, naturally gluten-free, and full of the best Italian flavors! Heat oil in a large stockpot over medium-high heat. Add onion, carrots and celery, and saute for 6-7 minutes, stirring occasionally, until the onion is soft and translucent. Add the garlic and saute for an additional 1-2 minutes until fragrant, stirring occasionally. Add the stock, lentils, tomatoes, bay leaves, thyme, black pepper, and crushed pepper, and stir to combine. Continue cooking until the mixture reaches a simmer. Reduce heat to medium-low and cover the pot partially with the lid. Keeping the soup at a low simmer, continue cooking for about 25-30 minutes or until the lentils are tender and cooked through, stirring occasionally. Stir in the collard greens, and continue cooking for 5 minutes or until the greens have softened. Taste, and season with additional salt and pepper if needed. Remove the bay leaves. This soup can also be refrigerated in a sealed container for up to 3 days, or frozen for up to 3 months. Add the first 12 ingredients (through the red pepper) to a large 6-quart slow cooker, and stir to combine. Cook for 4-5 hours on high or 8-10 hours on low, until the lentils are tender and cooked through. *If making this recipe vegetarian, use vegetable stock instead of chicken. **If making this recipe vegan, use vegetable stock and omit the cheese. ***If you would like to add meat, I recommend browning 1 pound of Italian sausage in a skillet separately. Then drain the grease, and stir the sausage into the soup. This looks so delicious (and healthy!) I love the fire roasted tomatoes in there! As a guest at each of the brunches described above, I thought they were fabulous. It’s a treat to spend time with friends and family, and eat in Ali’s fabulous loft – even with “al dente” veggie soup. I made a big pot of lentil soup for New Year’s Eve (considered to be good luck in many cultures) only to discover I was out of Parmagiana. We don’t have an all night cheese store, so I had to wing it with feta as a garnish. YUM! Can’t wait to try greens in my next batch. I’m always looking for new Lentil recipes (I just discovered how good they were…yes!) I can’t wait to try this, yum! This soup sounds great. I have never had collard greens – what do they taste like? Can spinach be sub for collard greens? or some other greens? Thanks. Thanks Connie, we hope you enjoy this! Collard greens are really hearty, and they have a little bitterness to them (but they are so delicious in this soup)! Spinach doesn’t taste like collard greens, but itcan definitely be used instead, we just wouldn’t add it until the very end, since it’s much more tender and delicate. Kale is a little more similar in texture, since it’s a thicker, sturdier green, so that would work well too. This soup look soo good! 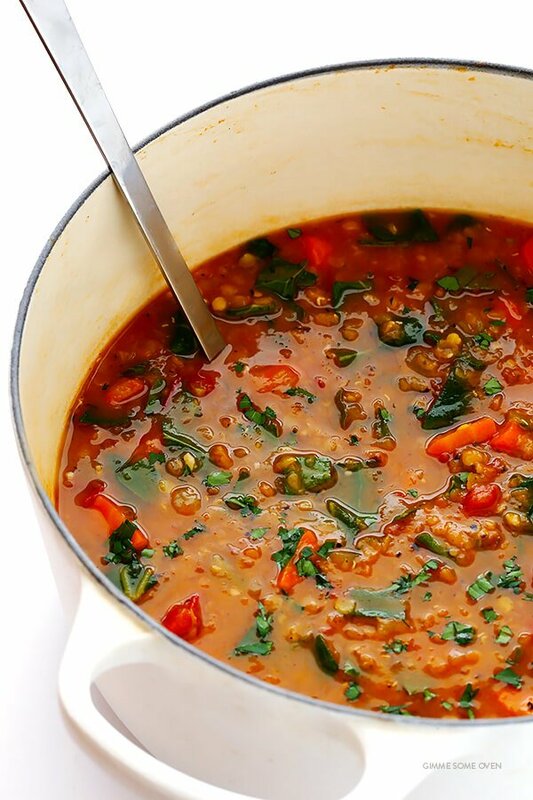 Lentils are my pure fav in soups! I bet roasted tomatoes added another layer of flavor. I made this tonight and, as always, it was delicious!! I’m sure it’ll be even better tomorrow. YUM! Can’t wait to make this! I’d like to add the sausage. When should I add it to the soup? Thanks Katie, we hope you enjoy! :) You can brown the sausage in a separate pan (you can either cut it in slices before or after cooking). Then add it once you bring the soup to a simmer. I’m putting on my Oakly sunglasses cause this soup is HOT HOT HOT! And the lentils come wife approved! This soup looks amazingly warm and cozy and perfect for January. Spinach has been my green of choice for a little while now but I think I am going to have to some of that collard green love. I made this on Sunday for my lunches this week. This soup is very very good. Added turkey italian sausage, used green lentils (what I had in the kitchen). Double the carrots, cause they are yum. It really is fantastic. I only have kale, and it’s so cold and windy here in Ohio that I don’t want to go to farmers market for collard greens. Wonder how this would taste. I’ve never used collard greens so I don’t know how they compare to kale. 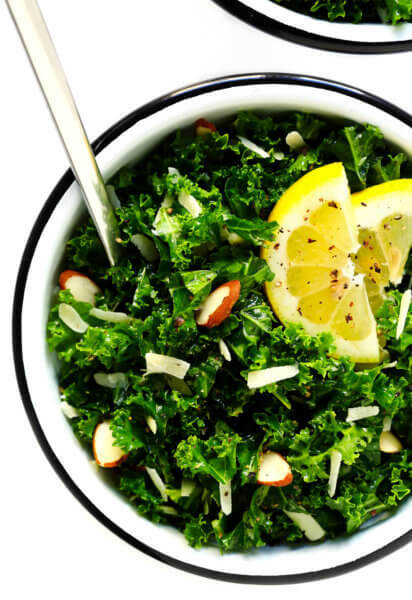 We think kale would be awesome (it definitely doesn’t taste like collard greens), but the texture is not too far off (if you use lacinato kale)! We hope you enjoy, stay warm! Made this last night. REALLY good! I made this last night using homemade chicken stock, and it was heavenly! This will be a regular in my house! Thank you! 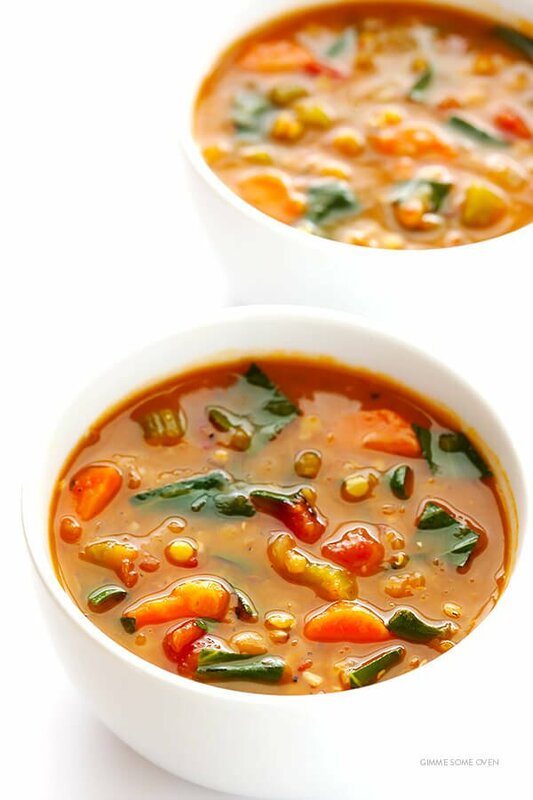 I was looking for a lentil soup recipe and came across your simple hearty healthy lentil soup recipe and your fabulous photos! Thanks , going to make it now! I loved this lentil soup! I substituted minor red potatoes (quartered) rather than macaroni, utilized 4 garlic cloves, and added red pepper flake. This turned out completely delicious, superior to my most loved Italian restaurant! Including good extra virgin olive oil and Parmesan at the end is a must! This soup is awesome! I’ve made it twice, both times using the slow cooker. The first time I sautéed the onions and garlic before adding to the crockpot, the 2nd time I just dumped it all in at once. Both were good, but the carmalizing of the onions gave the soup more depth, which is how I will continue to make it. Oh I also had some sundried tomato Tampanade, so I put a big scoop of that in, too. I used beet greens and they wear fantastic! I also tried the spinach, Meh, they basically disappear. The Parmesan really rounds this out! Highly recommend! Thank you! I love to make a soup on Sunday to eat for lunch all week. I can’t wait to try this one. It looks delicious! I made this tonight – delicious! I used Trader Joe’s split lentils which cut the simmer time in half (12-13 min) and subbed spinach for collards (adding the spinach the last 3 minutes of cook time). I also used hot italian sausage! All good! This recipe looks delicious! Just wondering if I should use dried lentils or canned for this recipe? I find that when cooking legumes such as lentils, tomatoe inhibits the cooking. I have ruined recipes when adding tomatoes before the legumes are tender. Tomatoes should only be added after the legumes or beans are tender. Thanks for your tip Sharon! I just made this lentil soup!!!! Delicious!! This one will be my all time favorite! Hey there! Quick question. I don’t think my local store has greens and I’m going to make your spinach artichoke dip. I was wondering if it would change it much if I used the left over spinach instead? We think that would be fine Mike — we hope you enjoy! I have made this 3 or 4 times now and it is AMAZING. so healthy, warm, and delicious! Made this tonight and everyone loved it. My 5 kids ages 13 to 4! They didn’t even realize they were eating collard greens. Thanks for the recipe! 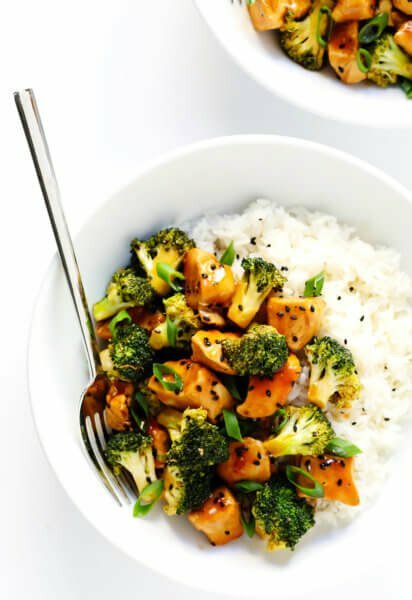 Healthy, vegetarian/vegan, inexpensive, and super delicious! If you plan on making this in the crockpot using sausage should you add it at the end with the collards or is it okay to add the cooked sausage in beginning with the other ingredients? I stumbled across this recipe the other day and immediately bookmarked it – I live in a housing coop and regularly cook for (weekly) potlucks, so a relatively quick, vegan dish for a large group of people is the way to my heart (and my favorite Pinterest board)!! When we got a HUGE batch of collard greens from our CSA this week, I knew this was exactly what I was looking for. Made it last night and I’ve got to say – WOW! I threw in some extra cooked lentils and cauliflower, and subbed the fire roasted tomatoes for crushed because we had an open can, and it was amazing! Rave reviews from all of my rabid vegan friends. Then I had it for lunch at work today with some crusty bread and I think it’s gotten even better with some time to sit. Thanks for sharing such a great recipe!! I’ve been looking for something like this for a couple of years, and it looked good. I made some, and it is easily the best soup that I’ve ever made! I don’t know what collards are, so I used spinach. I didn’t have any crushed red pepper, so I used paprika. I won’t be tempted to try to improve it. The whole household is swooning at the smell. Just finished making this soup. It rocks and I love that there’s so many nutrients in one pot. I used turkey and I just love how the preparation was easy and I found a way to use collard greens. Great recipe. 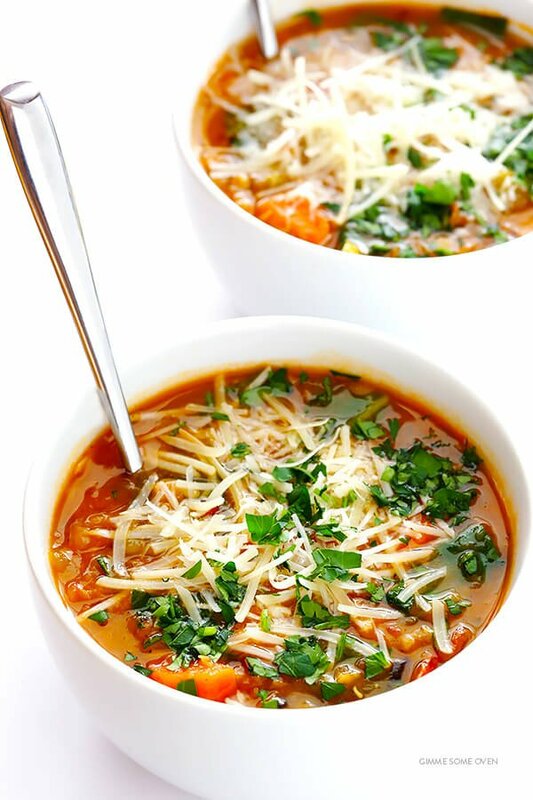 This soup is filling and perfect for a cold day. The colors and flavors are outstanding! Thanks, Jen — we’re glad you enjoyed it! While Collard Greens is probably the farthest thing from any Italian ingredient I’ve seen, I would substitute them with Broccoli Rabe. That would make the title more “factual than fictional”. Trying to call something Italian with Southern Afro American Collard Greens is equivalent to calling Middle Eastern Shawarma to a Italian Meatball Submarine. Collard greens are not even close to anything Italian in any “Italian recipe” that I have ever seen. I have 4 grandparents off the Boat from Italy living in South Philadelphia PA, and they never heard of “Collard greens” . Sorry The recipe is great but the title is misleading and a little Insulting to our heritage. Collard greens is NOT an Italian ingredient. It does not belong in the same sentence as Italian. This should be called Old Southern Soul food Lentil soup. Collard greens Italian, please……………………. I made the recipe last night and I loved it! Just I used spinach instead of green collard and turkey bacon. I’m itching to try this, but right away I find I have to substitute! Will be restocking my pantry in the near future… Substitutions this time will include coconut oil instead of olive, pureed garlic paste instead of cloves, regular tomatoes instead of fire roasted (can’t wait to try those! ), dill instead of red pepper, and spinach instead of collard greens… Hoping to make it according to recipe very soon! We hope you enjoy it, Nina! 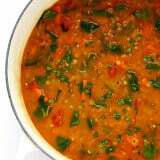 My husband loves lentils, as do I, so I am always on the lookout for a good lentil soup recipe. I made this last night. Very good recipe, we both ate two bowls each. I did add ground lamb, because I really love lamb with lentils. Also, I didn’t realize I hadn’t added the fire roasted tomatoes until we had polished off two servings! So, I added them anyway to what was left over. This is a very good, very healthy recipe which I know I will make again and again. Thanks for sharing with us, Farrel — we’re glad to hear you both enjoyed it! Any chance you have the nutritional information per serving for this? BTW loved the soup! But mine did not turn out orangy-red like the picture – any suggestions on what I can do? Maybe swap out some of the liquid with tomato sauce or puree? Hi Wendy! We’re sorry but we are unsure of the nutrition facts/amount of calories in this recipe. We currently are not publishing nutrition facts on the site, as the nutrition calculators available are not 100% accurate, and we never want to publish anything that might be misleading. However, a lot of our readers love the My Fitness Pal nutrition calculator, so feel free to try that for an estimate. As for the color, we’re not sure why yours came out differently (could be the lighting in the photos we took). We wouldn’t be concerned with the color as long as you enjoyed the flavor of the soup though! You could add tomato sauce or extra tomatoes if you want. We hope all of this helps! I don’t have access to fire roasted tomatoes but really want to make this with my chicken Italian sausage! Thoughts?! Hi Tracey! We think Italian chicken sausage would be delicious in this! I made this today with homemade broth, made it exactly as written. I did add some browned Italian sausage at the end when I added the collard greens. I thought it was very good, my broth made it a bit sweet since there was fennel in the broth. I think it is a keeper. I was light on the salt and didn’t add any cheese as some of the soup is going to a heart patient tomorrow. Thanks for sharing, Jane — we’re happy to hear you enjoyed it! I make this all the time and I love it!! My family loves it also. I teach Nutrition and Wellness and I always cook a pot of this for my classroom. I like to introduce to the students to healthy eating and also to try new foods. Most of my students have never heard of lentils. I only give them a small sample to start with and the majority of the class loves it and comes back for more. I cook lentils in the winter and I love them. My tip for this recipe is soaking the lentils in water for 4-8 hours it will cut the cooking time in half. I will definitely try this recipe next time, when it get a little cooler here in south Louisiana. Thanks, Julia — we hope you enjoy! I’ve been looking for more lentil recipes, this was fabulous! I might try it with zucchini or mushrooms next time but wow, very good! Thank you so much! I made this recipe exactly as written. It is AMAZING! Years ago I had a lentil soup that was similar to this at a restaurant and when I saw this recipe I just had to try it. I made it once using the collard greens and tomorrow I’ll try it with kale. I could have this soup every day, it’s that good. Thank you so much for posting this recipe!!!! I know I’ll be making this over and over again.